I’d like to find a 1:80 (?) tractor trailer set with rubber tires. I only need the cab, for the three axles, but I’ll buy/trade for a whole rig. I’m not exactly sure about the scale, I’m guessing with the 1/80th number, but I need tires that are 7/16" to 1/2" in diameter. 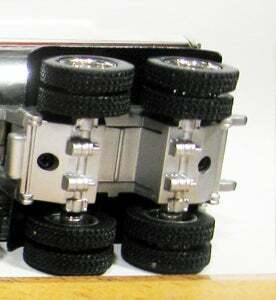 One front axle and the dual rear axles.